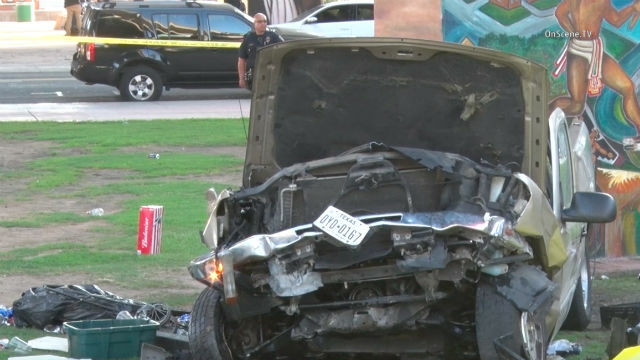 A Navy petty officer was “irritated and impaired” when he crashed his pickup truck into a barrier on a transition ramp to the San Diego-Coronado Bridge and the vehicle ended up crashing amid a crowd in Chicano Park, killing four people, a prosecutor said Monday, but a defense attorney said his client wasn’t under the influence and questioned the safety of the roadway. In her opening statement, Deputy District Attorney Cally Bright told jurors that Sepolio was traveling more than 80 mph on the transition ramp from northbound Interstate 5 to the bridge about 3:30 p.m. when he lost control of his truck, which plummeted into the park where hundreds of people were enjoying a rally for motorcycle riders. Besides the four people killed, seven others were seriously injured, the prosecutor said. Earlier that day, Sepolio texted a female Navy colleague, who was going to buy him lunch, that his goal was to get her “wasted,” Bright told the jury. Bright said Sepolio had a glass of alcoholic cider and he and the woman shared a bottle of wine at lunch. The two took an Uber back to her home and Sepolio took off, saying he had to make some calls, the prosecutor said. Bright said Sepolio was on his cellphone arguing with his girlfriend — who’s now his wife — 44 seconds before the first 911 call was made about the accident. Bright told jurors that Sepolio was traveling between 81-87 mph when he lost control of the truck, which hit the left barrier and careened across lanes, going up and over the right barrier and down into the park, nose first. The defendant admitted speeding up because a driver wouldn’t let him in on the transition ramp to Coronado, the prosecutor said. Another blood sample from the defendant was stored away and not properly maintained by the California Highway Patrol, the prosecutor said. Defense attorney Paul Pfingst told the jury that Sepolio, an aviation electrician who works on helicopters at North Island Naval Air Station, passed all the blood tests administered to him by law enforcement. A server at the restaurant where Sepolio and Ruiz had lunch told officers that she saw no signs of intoxication from the defendant when he was there, the defense attorney said.